Cricket has matured at 44.5" and 280 pounds, a very functional, versatile size. Like her brother Owyhee, Cricket has decided that she likes Gwen best. Also like Owyhee (and even more so now that Owyhee has died), it’s clear that because of her strong mutual bond with Gwen, Cricket is in the “never ever EVER for sale” category. Well, it SHOULD be clear ... the nerve of some people!!! Cricket shows nearly all the traits we can expect to see in an outstanding packer, including a seasonably shedding classic coat, albeit longer than our personal preferences, and (thanks to her mother’s curaca influence) a “stickier” undercoat that doesn’t comb as easily as a true Classic. Cricket is proving an eager learner, amenable and adaptable to new experiences, and she is also prone to looking to her handler in stressful situations. Cricket's only deficit is a degree of her mother's tendency to be more easily startled, especially by anything that even looks canine. Even with this problem, however, we are considering Cricket to be a breeding-quality animal, well-suited to passing on her sire’s best traits. Cricket occasionally traveled with Gwen back when Gwen was neglecting her sleep to assist with Get Connected! training workshops. Workshop attendees thought Cricket did great demonstrations; Cricket thought it was just great to do familiar things with Gwen, even if it had to be in strange locations. 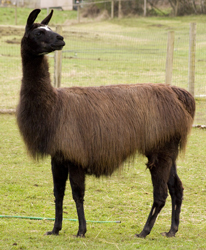 Currently Cricket pursues a bit of packing and (for the brief period when a separate division for Classic llamas was in place) a little showing here and there — mostly halter classes, but also, rather by accident, a few performance classes as well. Cricket’s halter class show record is spotty (typical for any good working llama), and her performance class record is abysmal according to the final placings. In reality, Gwen has been exceedingly pleased with and proud of Cricket’s willingness to step outside her comfort zone, and also to clearly state what bugged her in two extremely distracting and challenging situations in which even seasoned performance llamas were clearly rattled. Cricket shares her sire Ranger Dusty’s gaits, energy, and powerful rear end muscling, and that’s what counts on the trail. We were looking forward to enjoying some offspring from Cricket, but Gold'n Hawk's untimely demise has put that on hold for now. As good as Cricket is, she does have traits that require very mindful pairing when choosing a stud. Cricket likes to explore, run and do leaping twists straight up in the air, and she enjoys figuring out what Gwen tries to show her because Gwen takes the time it takes to explain it so she can understand it. Remember, NEVER FOR SALE. Translation — if you really want to make us angry, offer to buy her. Like most crickets, Cricket is both black and a highly accomplished leaper. She's much more muscular and flexible than the insects, though! Although completely unintentional when she was named, it turns out that Cricket is very much "into" wireless communication as well.